Jazzing up the exterior of the home will set high buyer expectations – before they even set foot inside. And many of the fixes outside the home represent some of the highest return on investment of all renovations. To boot, they’re oftentimes the cheapest. Here are four easy – and inexpensive – outdoor renos. Doors are one of the first things a buyer notices about a house. 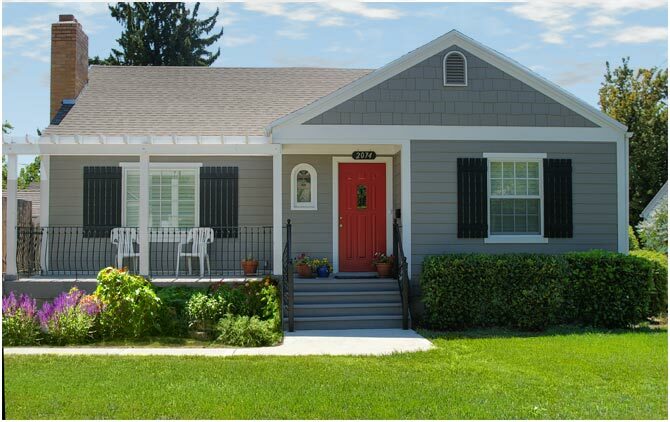 Changing the front door can change the entire look of the home. Add a door with square feet of glass for a light and airy look; or try a steel door for better security. Plus, lots of doors are customizable, making it easy to set your client’s property apart from others up for sale on the same block. Just as there are several different types of doors, there are a slew of different styled fences and gates that your clients can choose from. And, like doors, these fences can be used to compliment the style of the home. A quaint property might benefit from a traditional picket fence, while a large stone house might be completed with a wrought iron gate. Nothing’s changed here: Simple landscaping maintenance continues to go a long way to enhancing curb appeal. Suggest your clients lay new sod, if necessary, or add colourful plants to a flowerbed. Lawns will need to be mowed as often as twice a week while the property is listed, and weeds pulled. In the wintertime, ensuring walkways are plowed and salted are also a must. Canada’s brief summers put outdoor living spaces on almost any buyer’s wish list. There are several ways your clients can play up the house’s backyard space. Again, ensure the lawn and flower beds are well-groomed. If the property has a pool, have your clients clean it of any debris before showings. Staging an outdoor space is increasingly a good investment. That exercise extends to adding a patio set and a barbecue and laying deck tiles. Show buyers what their summers can be like if they’re lucky enough to win this house.